Today I discovered a whole new way to use Sagepoint to organize my son’s baseball team. Read this…..it may save you some time and from possible discomfort. My husband is managing a baseball team consisting of 12 wonderful boys. There I was at the team’s first practice, assisting, with my sheet of paper on a clip board and pen in hand. Twelve boys, twelve different numbers. One by one I spoke with the boys and their parents about their pick for jersey number. The first few were easy, but as the number choices got fewer, some negotiating had to be done. I was in a sensitive position a few times when kids asked for the same number. I did not like disappointing the kids, or their parents, with news that they had to pick a new number, especially since this was the first time meeting them. The whole process was a little awkward and took longer than I had anticipated. That’s when I realized it; I should have used a Sagepoint online signup sheet. Players and their families can discuss the signup in the comfort and privacy of their own home, and not feel put “on the spot”. Sagepoint’s signup sheets are in real time, so duplicates will not happen. If the jersey number is already taken, it shows on the list as signed-up. Remaining available choices are clearly listed. I set up the signup sheet, and it gets emailed to all parents along with an email invitation that I can personalize. Reminder emails are automatically sent out to parents to sign up by my specified date. I login to my Sagepoint account from time to time to see if parents have viewed the signup, and if they have input their response. If they have not, I can choose to contact them individually by Sagepoint email, by phone, or in person. After the signup due date, I can log into my account to access my completed list. The sample view to the right is what people who sign up will see. In my view, as the coordinator, I will have a list with names and jersey numbers. If there are any questions or problems, parents can easily contact me through Sagepoint email or by phone, if I choose to list my number on my signup page. There are countless other ways our baseball team will be using Sagepoint to simplify planning and fundraising, so why not start with this signup? 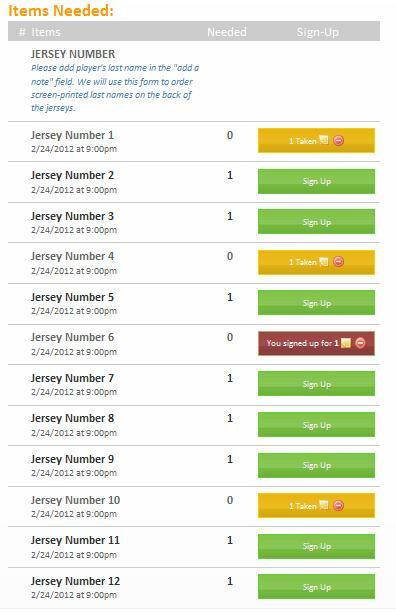 CLICK HERE to see the full example of a free online signup sheet for baseball jersey numbers right on Sagepoint website. SAVE TIME by using Sagepoint as your coordination tool. Now you have time to explore other ways of contributing, or just spending a little time on yourself or your family. “LIKE” us on our Facebook page to get more information and new ideas on setting up your team’s schedules. I will also have creative ideas on how to make your sports season more memorable. If you have any unique ways that you have used Sagepoint, please leave a comment to share your ideas. Together we can help make organizing groups easier for everyone. This entry was posted in Online Organizing, Organizing, Sports Teams and Leagues, Tips For Using Sagepoint and tagged Baseball, free online organizing, free online signup sheet, free online signup sheet for baseball, free online signup sheet for softball, organizing a baseball team, sagepoint, sport, team jersey number, Teams, tips, www.sagepoint.com, youth sports on February 24, 2012 by Vivian.